A Makeup & Beauty Blog – Lipglossiping » Blog Archive Win it! 3 EcoTools Bamboo Bronzer Brushes to win! I’ve written about these before, you know I love them, I want you to love them too! I have three to give away (worth £9.99 each), so read on and find out how you can score yourself your next favourite face brush! Good luck! 3. 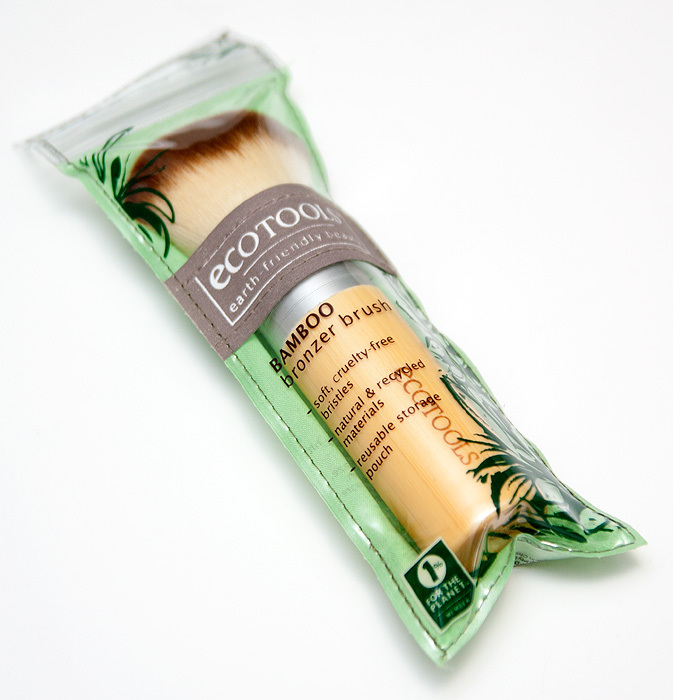 There are three prizes to be won, each comprising of an ECOTools Bamboo Bronzer Brush (worth £9.99 each). No cash alternatives. Oh, that’s a nice giveaway! I always wanted to try one of the EcoTools Brushes, since I am a Vegetarian for 13 years and I try to only use Vegan stuff… the other synthetic brushes that I use weren’t really successful for me. I have a Eco Tools travel set of 6 brushes and those are my favorite! My favourite brush is a kabuki by Valerie Beverly Hills. I’ll be extremely sad the day it goes to brush heaven (hopefully not for many years). I have a bunch of ELF brushes that I got at Target. I love them because they work nicely but if something happens, they’re really easy to replace! I love the Real Techniques Buffing Brush. The brush I use the most is probablt my real techniques buffing brush. It’s nice and it was really cheap. I have the EcoTool Blush Brush and love it.. especially because its all natural! the powder brush from real techniques, it is huge!! My favorite brush is an angled eyeliner brush – right now I’ve been using one from Sonia kushuk(?). I was eyeing some Ecotool brushes as Ulta the other day! I would love to own one! Great giveaway! I love stippling brushes (I’m not naming brands because there are several good ones), they are fantastic for applying cream blush and they give that “airbrushed” look that I love. my favorite brush is from the brand Essence, they’re cheap but have a great quality!!! I think my favorite blush is a private-label type synthetic flat-top kabuki from Meow Cosmetics! It’s super soft and works great with powder, liquid, buffing, everything! But a close runner up is the new Urban Decay Optical Blurring Brush for my liquid foundation. I love my MAC 217 eyeshadow brush. If I travel I can get by with only this one brush. My favourite brush is the Elf Studio Powder brush. I can always rely on it! My favourite brush is real technique Blush brush and the stippling brush. Ecotools makes great brushes! I deffo think they’re underrated! Hard to pick what my favourite brush overall would be! MAC 217, hands down. Don’t know how I ever lived without it I love brushes! My favourite brush is my Sephora “C” eyeshadow brush no9. It was one of my first brushes I bought maybe 7 years ago and I use it everyday. I love my Mac 208 brow brush – makes defining eyebrows a lot easier! My favourite brush is a no 1 water colour brush, I use with Gel Liners. My favorite brush, just by how cheap it was ($1!) and how long it has lasted me (at least 5 years) is just the regular elf eyeshadow brush. I use it every day. I love EcoTools small eye kabuki brush, it’s quite versatile and sooo soft! I recently bought a brush from Sephora to put on concealer with and it’s my new favourite – I had always just used my fingers before and now it’s like all my concealers are brand new and way better! I really like my dual-fiber brush for applying blush. Oooh, I actually have an EcoTools blush brush that I absolutely love. I love EcoTools but had only tried the foundation brush so far! My favourite brush is my Smashbox Face and Body Brush #19 but I have heard great things about Ecotools! I don’t own any brushes. Well, I mean I own them but I don’t use them. I apply all my makeup with my fingers like some sort of ham fisted three year old. actually my fav brush is an eyeshadow brush made by a company called basics. Not sure if its available worldwide as I’d purchased it online from India. It was only 95 rs, which is about 1 pound so that is cheap as! Amazing brush and it really packs on the colour well! I own a couple of no-name and drugstore brushes, but lately I’ve been thinking of trying the brushes from Real Techniques or Ecotools. I’ve heard so many good things about them! My all time fave has to be the studio flat top powder brush from elf – I’ve got three of them, one for waxy/cream foundations, one for liquid foundations and one for powder. I’d be lost without them, my base is always much smoother and more even when I use them. Although I bought a No7 smudger brush for eyeliner with one of the recent money off vouchers they give out and that works better than any other I’ve tried as the bristles are so short and dense – that’s getting a lot of love too. I like my elf duo fiber brush, large. My favorite brush is the elf studio powder brush! This teeny tiny art brush that I use for concealing. Seriously tiny! It makes really neat pinpoint concealing easy, which I need when I don’t wear foundation, which is always. No concealer has yet matched the see through paleness I’m, you know, BLESSED with, so moderation is pretty important to avoid looking spot-oompa loompa’ed. I’ve never tried eco tools brushes since in greece you can find them only online and there are few reviews about them!So i’d love to win one! Also I forgot to mention my favorite brush is Sigma f80!! I’ve been wanting to try this brush for a while! my favourite brush is the real techniques blush brush, its so soft! My favourite brush is my Ecotools blusher brush, it’s so soft and easy to use. I want to get all their brushes, I have a couple and love them all so far. My favorite brush is my Japonese eyeshadow brush! my favorite brush is a real techniques stipple (dont know if this is the actual name :/) brush. its brilliant. love the look it gives. My Mac 239 as its super versatile and can be used for blending or packing on colour with creams and powders. Currently it is my Bare Escentuals Handy Buki. I’m really loving RT Blush Brush at the moment. It’s SO soft and it blends both my blush and bronzer perfectly! I swear by my Sigma brushes, but have always wanted to try this brand! I love my Real Techniques expert face brush! It blends my foundation so well, and really does give the whole “Airbrushed” appearance we all strive for!! Fab giveaway! My favorite brush is the EcoTools Bamboo Blush Brush and the No7 Blend & contour brush! I love my Elf brushes, no one in particular. I’m lacking in brushes, so would be great to add another. I need a new brush… my current ones are lookign quite sad! My cheaporama flat eyeshadow brush from Boots 17. Not a multitasker, but can’t be beat for value. I suppose my favourite brush would have to be my MAC 168, as a major contour kid this one is great for making the world think I actually have some sort of cheekbones/definition. I own the retractable blush brush by EcoTools and it is incredibley soft! my current favourite brush is urban decay’s buffing brush (i believe its called the good karma brush), its sooo great for liquid foundation! My favorite brush is my MAC 217, it works wonders with eyeshadow and it practically makes the color blend themselves. I’m so happy with it that I bought two, even though I feel they are incredibly overpriced here in Sweden. My actual faves are the Makeup Geek Blush Brush & Highlighter Brush! but I love to try Ecotools so looong! Thanks for hosting this giveaway! I do like Lunasol’s brushes although I only own one to date: their blush brush! My favourite brushes are Cozzette, but Ecotools are very good and much more readily available. I always recommend them to my clients!